On an episode of The King of Queens, Doug is in the middle of a conversation and takes a bite of cake. He quickly ignores the other person, looks down at the plate and says, “Oh my gosh, this is made with real butter.” My wife had a nearly identical response when we were eating breakfast at Penny Ann’s Cafe. She had just bitten into the “heavenly” hot cakes—and fell quickly in love. There are many breakfast joints in Salt Lake City, and a few that really stand out. Penny Ann’s Cafe is an out-of-the-way location, and you won’t find it on any tourist brochures. The food, however, is better than anything found on any brochure. Breakfast is the cafe’s crowning achievement, and the pinnacle of breakfast is the heavenly hot cakes. 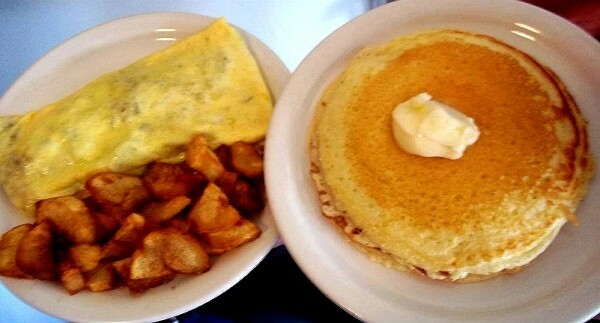 Pancakes at some breakfast joints have become a mash of dough where the butter and syrup provide the only flavor. At Penny Ann’s, the hot cakes are “light and airy sour-cream pancakes.” It’s not just the ingredients that make a great hot cake, but the process. Penny Ann’s has perfected both. You can order the hot cakes by themselves, or get an entree in which they are included. I highly recommend the pot of gold. It could be referred to as a skillet, but I feel it’s more like a mélange of deliciousness: potatoes, meats, veggies, cheese and eggs topped with tasty sausage gravy. Each component is like one more firework in the grand finale—it makes them all taste better. All the food on the menu is housemade and gives you the feeling that you are at a country bed & breakfast. The sausage gravy alone could be eaten in a bowl by itself and leave you happy. Simply walking into Penny Ann’s makes me happy.